SNAXPO is SNAC International’s annual trade show devoted exclusively to the international snack food industry. In the SNAXPO exhibit hall, suppliers to the global snack industry showcased the latest equipment, technology, ingredients, products and services available to help snack producers grow their businesses. Over 1,100 snack industry professionals from around the world attended SNAXPO 2017, including over 100 international attendees, meeting with 146 exhibitors on the trade show floor, including 37 first-time exhibitors. Booth 930 will display LIVE DEMONSTRATIONS of the sensor throughout the show – stop by and check it out! 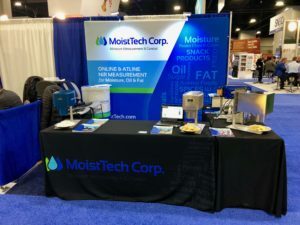 With the help of food industry partners and 40 years of knowledge and experience, MoistTech has developed online and lab moisture sensors for the analysis of moisture of all types of food products. Using both NIR (near infrared) and RF (radio frequency), MoistTech has thousands of installations in a wide variety of food products, from slurries to powders. While moisture is our major focus, we also supply analyzers for the continuous online measurement of protein, fat/oil, sugar, caffeine and other constituents/elements that absorb the NIR beam. On moisture applications involving dried products, accuracies can be expected to be 0.1%. On higher moisture applications, accuracies can be expected to be 0.2 and 0.5%. Fat/oil measurement and protein accuracies are subject to application. Please consult a factory representative for further inquiries. We recommend installing sensor(s) at the exit of the ovens, close to packaging so that it will allow the food time to stabilize while cooling. The sensor should be installed several inches above the conveyor belt or screw conveyor so that it can continuously monitor the process and can control the moisture content either manually or automatically in the finished product.